Basically, the Kremlin had a “Secret” undisclosed meeting with Israel’s prime minister. One can conclude that this was not for some sweet Russian vodka but one can only guess. Surprisingly, within the next few days Russia announces that it will not include Iran in the Caspian Sea talks which Iran has participated in since 2001. Hmmm…that must have been some damn good vodka! Iran seriously pissed about that …released this statement. 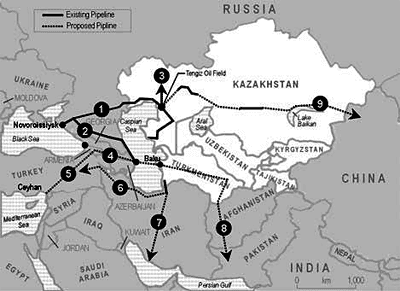 On Sept 10, 2009 an Iranian Sea lawyer (no not joking they really do exist) laid out the various proposals on where this pipeline could go. I included the graph so everyone can see how the chess board looks as well as the link below. So to save some face Russia comes out the next day and says that they are supporting Iran against the US but I have this knack for watching what people do as opposed to what they say… full article here. But Mr Lavrov added that he did not think the UN Security Council would support oil sanctions against Iran. "Some of the sanctions under discussion, including oil and oil products, are not a mechanism to force Iran to co-operate, they are a step to a full-blown blockade and I do not think they would be supported at the UN Security Council," he said. So why would Russian’s care about the Caspian Sea? Well as we all watched them steam roll and secure more land along these proposed pipelines a few years ago (with not so much as a flinch from either BUSH/OBAMA tag team administration), we have now just sent 7.8 BN of Patriot missiles to Turkey as reported by Ran Squawk yesterday. So to my fellow geographically challenged American’s please scroll up and take a look at where Turkey is so you can see with Iraq now out of the way, along with Admiral Mullins fearless battle cry yesterday to “increase our size of military troops in Afghanistan” along with Israel’s September deadline looming the noose around Iran’s neck is slowly tightening. Remember when Russia cut off gas to Europe? Of course this has nothing to do with Russia trying to protect its monopoly on its European friends and FOR SURE this has nothing to do with feeding the 2 fastest economies in the world (China and India) a direct line of oil and gas …that would be TOTALLY ABSURD! I may just steal a “Goldmanism” and say it is damn right ‘conspiratorial’ to suggest such an outlandish plot exists. No fear my fellow taxpaying American’s this is about fighting terrorism. So how can you get the American people behind a war? What would possibly stir the US animal spirits again like 9/11? Well as Rahm Immanuel said, “you never want to waste a crisis”….so what is the crisis? I haven’t found one yet but certainly the dollar is not looking to good or the bond market, not to mention all the historic debt the international bankers just piled up on the fed’s balance sheet. Well the Iran war drum is loud and clear and after visiting www.CFR.org it became clear that there is a lot of nuclear talk lately so one can only guess. I was once told that “if you want a new idea read an old book” well if you recall World War II brought us out of the Great Depression nor am I suggesting World War 3 but and as Mark Twain said, “….history never repeats itself; at best it sometimes rhymes.